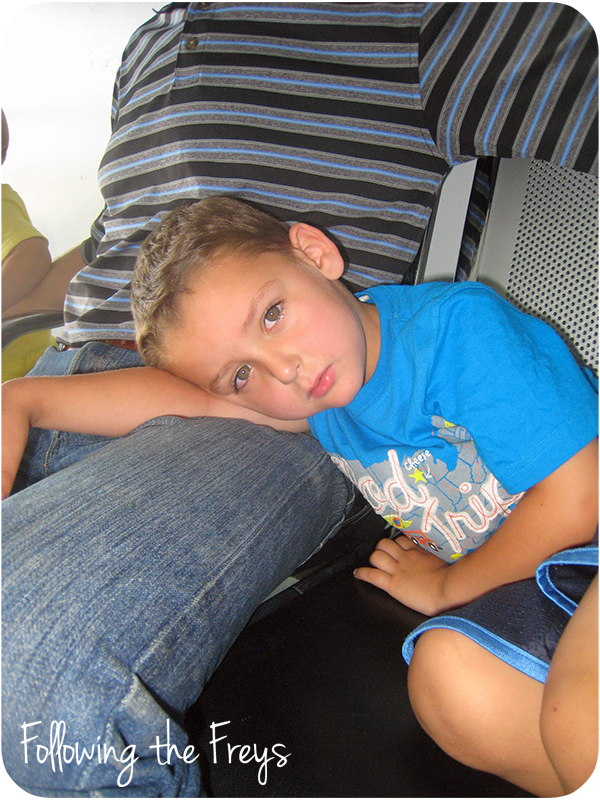 Here is Greg waiting for our flight from Port Moresby to Brisbane. He looks a little miserable for having just started a long journey, right? Well, he had a 102 degree temperature at this point, and our first hour or so in the Port Moresby airport was less than ideal. I needed medical clearance to fly while pregnant on this airline, and although we had taken the correct steps beforehand to get the clearance, somehow the news didn't make it to the good folks at the check-in counter. So we had to wait in the busy, hot check-in area for over an hour while phone calls were made and the miscommunication straightened out. Thankfully we had plenty of time before our flight. Greg's fever turned out to be just a 24-hour thing that never presented with any other symptoms, for which we were grateful. We spent two nights in Brisbane, Australia. 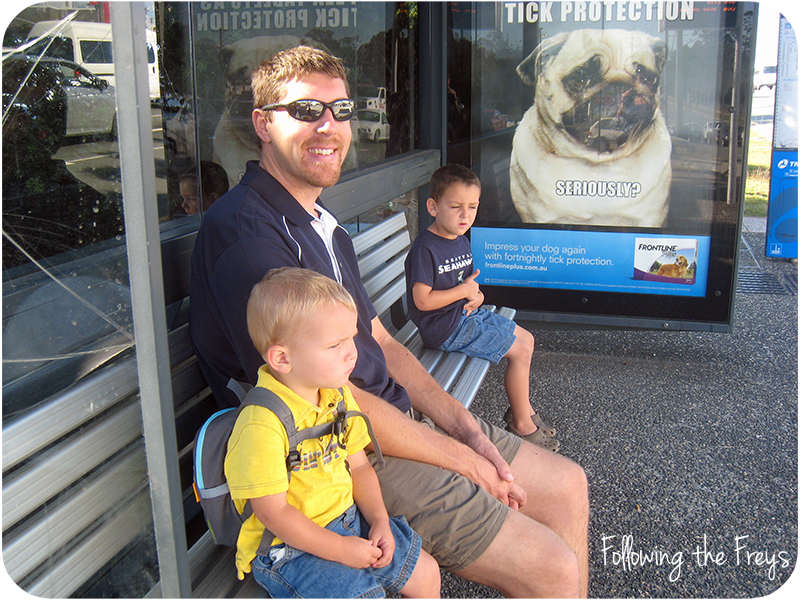 We had originally planned to take the boys to a wildlife park, but decided not to because Greg was still feeling sick and Caleb was pretty stressed out by all of the changes and travel. 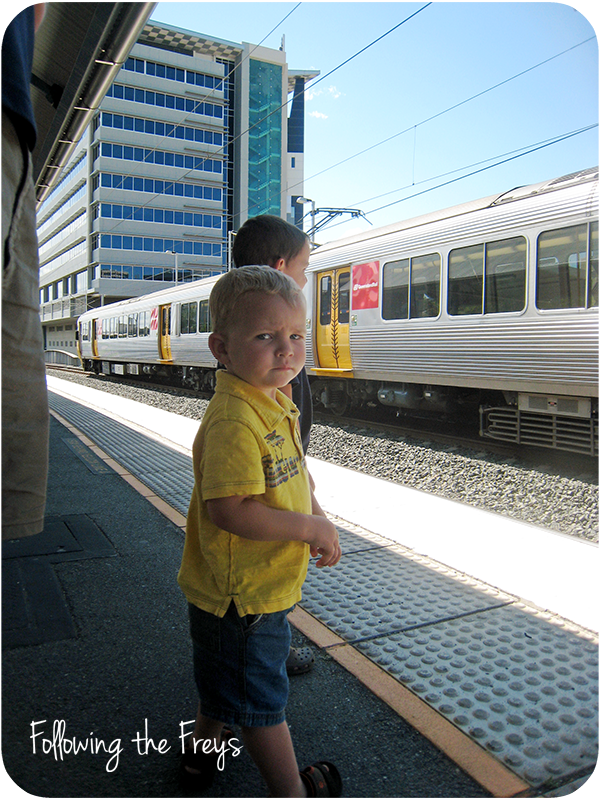 We fell back on an old standby - the thrill of public transportation for little boys who don't normally get to ride in buses and trains. You can see that Caleb looks pretty serious. He was uncharacteristically clingy and would cry at the drop of a hat. Poor kid was totally overwhelmed by the city. 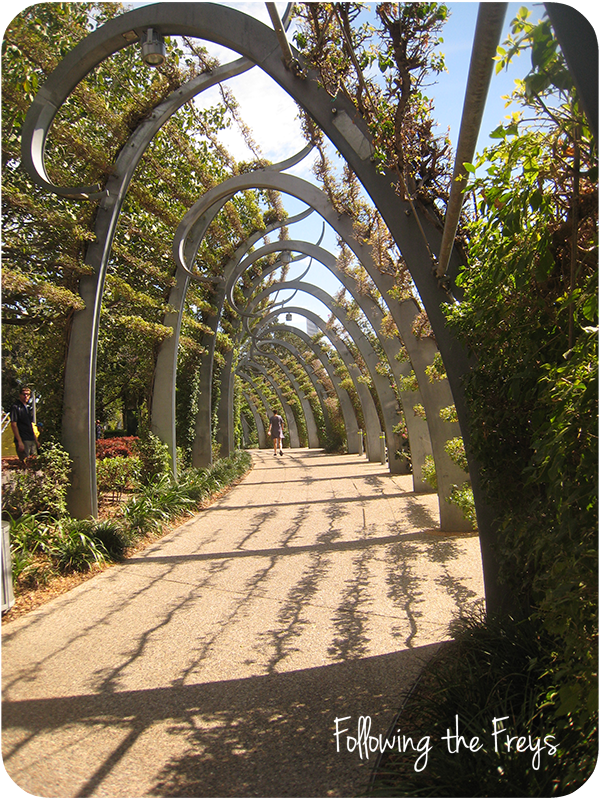 We traveled to Southbank, a nice area along the river with gardens, parks and shops. It was good to let the boys run and play. Personally, I just couldn't get over how nice and clean and well-groomed everything was. One thing we don't get much of in PNG is well-kept public spaces in cities. Waiting for the train to go back to the flat where we were staying. 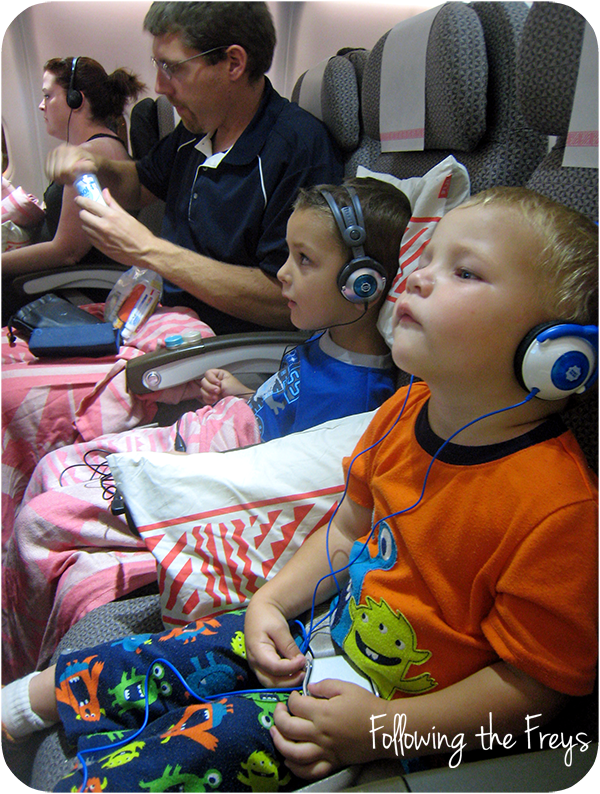 Wednesday was our longest day, with three flights and crossing the International Date Line. 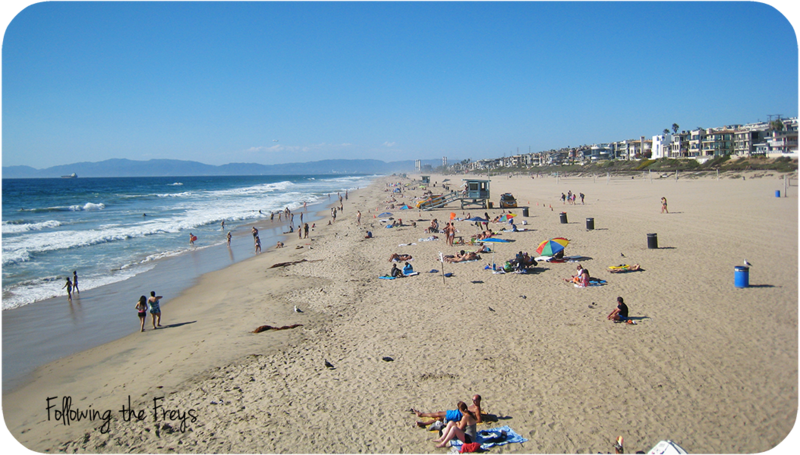 We flew from Bisbane to Nadi, Fiji, then to Los Angeles and finally to Denver. 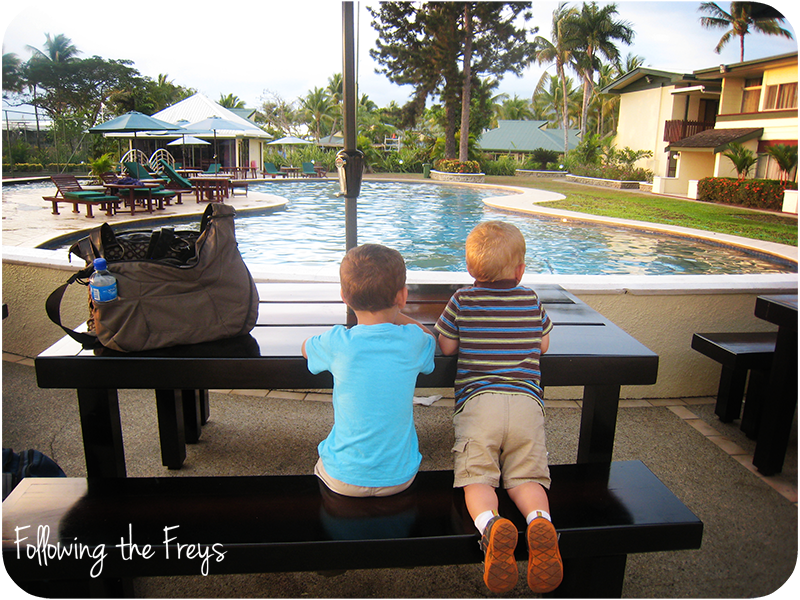 With five hours in Fiji, we left the airport and walked to a nearby hotel for dinner. (The boys were very disappointed that they didn't get to swim). On the longest flight (10 hours) from Fiji to LA. We changed the boys into their pajamas before we got onto the plane, but they got to watch an episode of Bananas in Pajamas (pronounced with an Australian accent, Greg insists, because he's never seen the American version) before going to sleep. By the time we got to LAX, you can bet we were ready to get home to Colorado to see my parents. The boys, who had traveled fairly well all things considered, were starting to fall apart. However, we discovered that our flight to Denver had been canceled because of the merger between two airlines. They could book us on another flight of course, but it wouldn't leave until 8:30 in the evening. That meant we had another five hours before we could board our next airplane. I felt like crying. 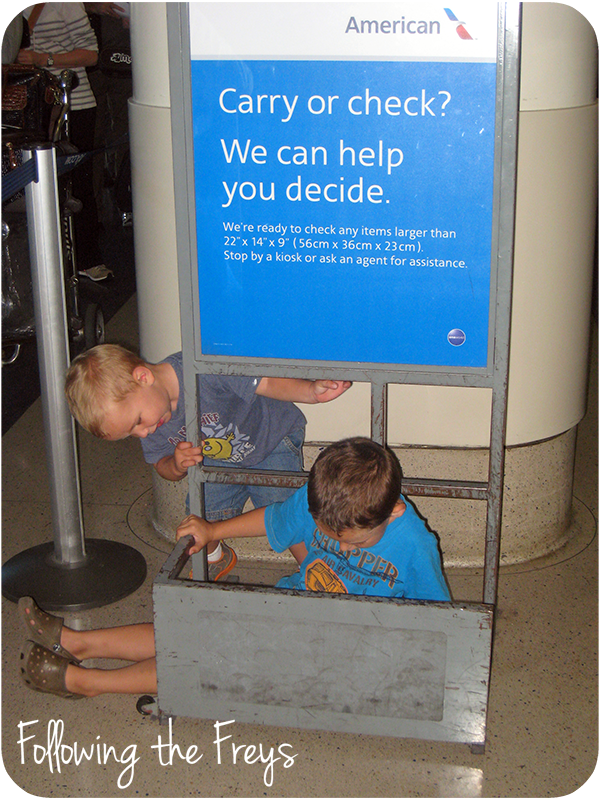 The boys decided to play in the carry-on measuring thingy while we spent about an hour getting re-ticketed. There were a few points where I felt about ready to send one or the both of them as checked luggage! Brian held us all together however, and convinced me to leave the airport for the sake of mental health. We took a taxi down to the beach. It was perfect weather. Walking around the beach while carrying your carry-on baggage isn't ideal, but thankfully there were other diversions, including a small aquarium that the boys loved, and some ice cream cones. Now we are at my parents' house in Fort Collins, and are working at getting over jet lag and seeing relatives that we haven't seen for a long time. 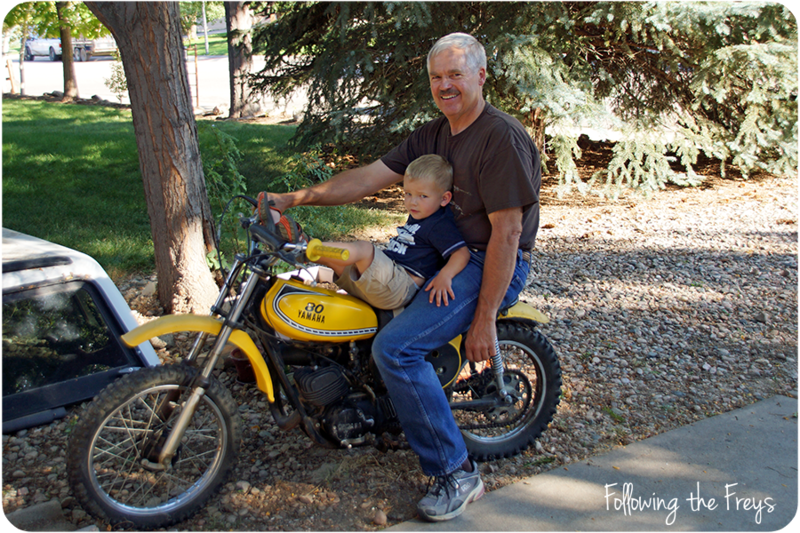 Here is Caleb with Grandpa. We were really impressed at the work my folks had done, putting up a temporary wall and cleaning out their basement so that our family could have our own space. I have more photos I could include, but we have more family coming over tonight, so I'll leave it at that. 'Till next time! Glad to hear you made it to Colorado! What a trip!